Besides those magic show I watched during kiddies party or some events, I have always watched those magic shows by magic masters like David Copperfield on the tv, never have had the chance to watch it live, with the magician doing the tricks right in front of me. Imagine my excitement when an invitation was extended to the DinoFamily to watch a magic show by 4th time Merlin Award winner Joe Labero, we of course accepted the invitation gladly! However, as the day for the show draws closer we were informed that the 3pm show was cancelled due to some technical faults, so we have to go for a later show at 730pm. 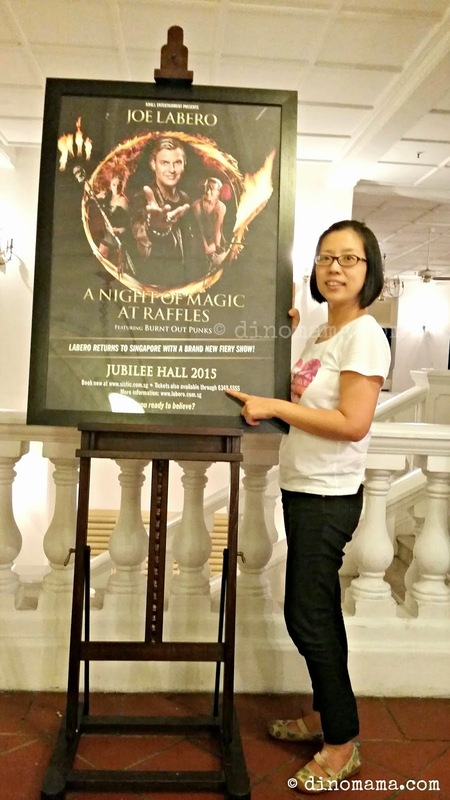 On that night, the small theater (or ball room, since its held at Raffles Hotel) was packed full with people. I think they were trying to accommodate as many people from the earlier 3pm show as additional rows of chairs were added at the back of the theater, with many chairs added at the end of each row of seats. Despite the *blocked views and having to stare at the tv screens up at the wall most of the time, we truly enjoyed the whole show! The wittiness and sense of humour of Joe Labero with his magnificent illusion, the spectacular performance by the fire artists - Burnt Out Punks makes it a night to remember, many a times we were left in awe, dumbfounded and wowed after each tricks. My jaws literally dropped when I saw a pair of beautiful long legs walked out onto the stage, we can't see any upper body on top of these legs! Besides the usual "cut the man and move his body parts around", in this case it's Animal, tricks there are many many unbelievable ones such as walking through the body of the beautiful Elin, walking into the mirror and many many more. I'm not going to let the cat out of the bag any more. We also love the solo fiery performance by the Burnt Out Punks duo where they swallow, swing, throw balls of fire while doing difficult and dangerous acts with great agility (no safety harness attached too!). You've seen these on tv but its a different feeling when you see them do this in front of you, it was breath taking! At the end of the show there is a standing ovation as expected because Joe Labero's performance is just too amazing! We didn't want to leave our seats after the great magician disappeared, we were half expecting him to come back from some where. Oh well, he is gone for good, ok ok not for good but instead to outside of the theater to get ready to meet & greet all his fans! We would very much love to have a little chat and a photo with the great magician himself but the queue was so long! Nevertheless, we were happy to took a photo with the Burnt Out Punks, they were so friendly and not as scary as we have seen them on stage. DinoBoy saw the right bandage on Animal's hand and asked him about it. Animal said he got injured when he was rehearsing the act earlier. Wow, it is DEFINITELY danger acts they are doing, we were glad that he was ok.
Having entertained millions of people with a number of sold out tours to his name, I strongly suggest that you quickly buy your tickets to watch Joe Labero and be enthralled with his illusions, magic and comedy. I was initially not very happy with it, so here is my little rant about it. 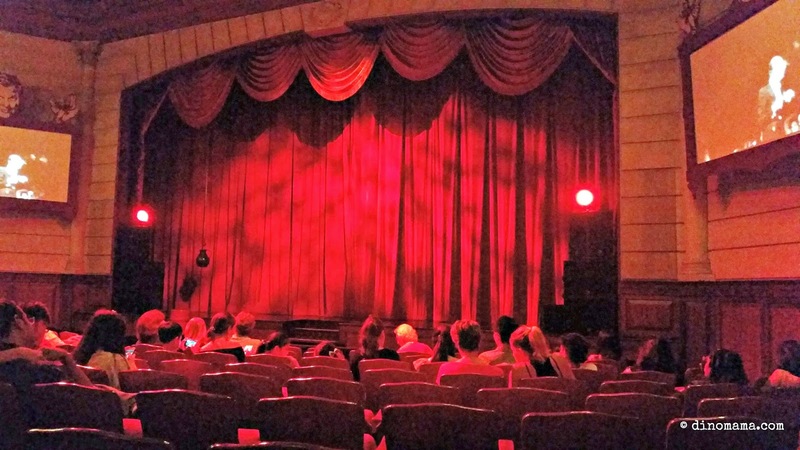 Well, my excitement for the show was immediately snubbed half when I collected our tickets, we were given seats that was far back to the side. Since we were invited to watch and review the show I would have thought we will be getting seats with better view so that I can be immersed in all the actions which would have enable me to write a better blog post later. Ok, never mind that, I told myself to enjoy it as much as possible. And as people started to fill up the seat, DinoBoy's view was blocked and all he could see were the back of many heads. Yes there were booster seats available but they were not the usual ones you see in theater or cinema, they were more like those padded cushion you buy to put on your office chair. So what do this Mama do? I went to grab another 2 more cushions and we have a happy DinoBoy but a not so happy person behind him (Sorry friend at the back!). I've voiced my concerns in an email to the PR company who were apologetic and really nice to offer us tickets to watch the show again but we declined because we like to let others have chances to watch this great performance. Nonetheless!!! This does not prevent us from sharing with all of you~ Come come, try your luck to win one of the 3 sets of 4 tickets to A Night of Magic at Raffles with Joe Labero in our giveaway! - Participants must be of legal age of 18 years old and above. - Winners will be randomly picked, double chances for those who shared via instagram. 1. Date of performance will be arranged by the organisor after the giveaway ends. 2. Collection of tickets will be an hour prior to the performance time outside the theater. 3. Children under age of 5 will not be allowed entry, this is because special effects are used during the performance and may scare the little ones. 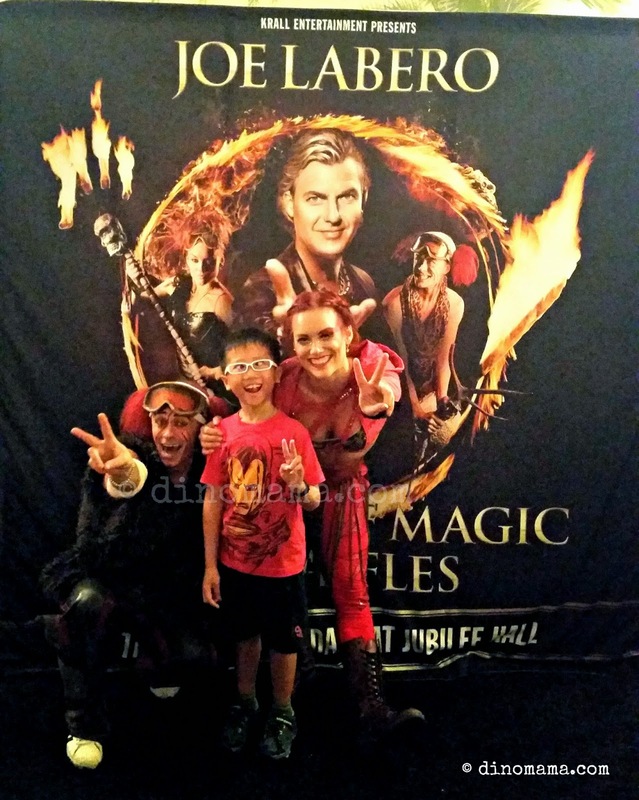 Disclaimer : We were invited to watch Joe Labero's A Night of Magic at Raffles for the purpose of this post & giveaway, no other forms of compensation were received. All opinions are 100% ours and based on our first hand experience at the magic performance. All photos, unless otherwise credited, are copyrighted and belongs to the DinoFamily, you may not use it for any purposes without seeking our approval.